As the regular and attentive reader will by now have figured out, I’m quite big on chilies. And with it being harvest season for Danish chili growers, I’ve been quite blessed in terms of donations over the last couple of weeks. Most notably so, I’ve recently received a donation of a pound of ghost chilies (or ghost peppers as our american friends say) from a fellow foodie, good friend and fan of this site. With chilies being perishable little things, this has of course prompted me to think fast in order to figure out just how to either make use of or preserve a pound of these fiery little buggers before they go south. The Ghost Chili: In all its pretty glory! Just what on earth is a Ghost Chili? 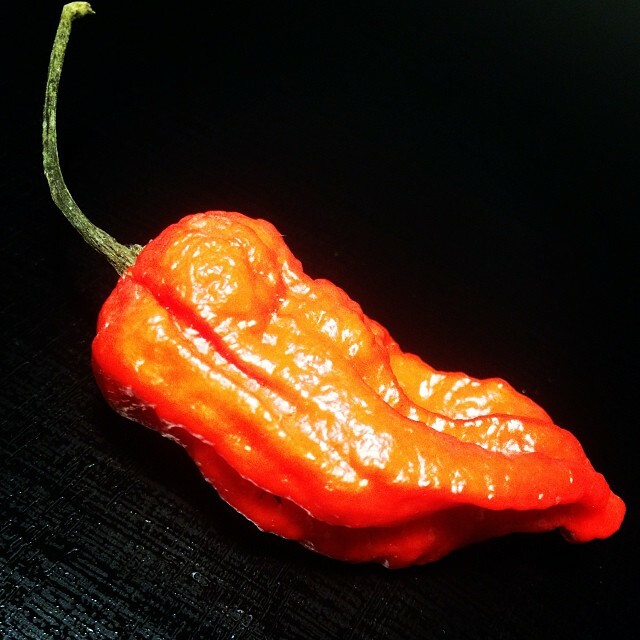 Ghost Chili, or Ghost Pepper, is supposedly the verbatim and somewhat fitting translation of the name Bhut Jolokia given to a particularly hot strain of chili found in the Indian states of Assam and Nagaland. Measuring in at around 400 times hotter than Tabasco sauce, it was until recently considered the world’s hottest pepper. Having previously been used as non-lethal weapons and a way of warding off stray elephants, amongst other things, it’s now a popular eat and rite of passage among chili heads. Now, obviously, cooking with ghost chilies can be difficult as they pack quite a serious punch. Nevertheless, they deliver a fruitiness and an aroma so unique that it is not to be missed. The good news when it comes to cooking with ghost chilies is that the aroma and fruitiness is present even when miniscule amounts are used. The bad news when it comes to cooking with ghost chilies is that the same can be said about the heat. Even small amounts will produce a burning sensation and a tingling numbness of the lips that literally will last for minutes. This is great for chiliheads, but may not go down too well with people not accustomed to high heat levels. So be careful with guests. Ghost chilies are extremely hot and the capsaicin within them WILL hurt you if you’re not careful. Handle with care, seriously! If you’ve got any history of sensitive skin or inflammation, consider wearing rubber or latex gloves when handling. If using bare hands, wash THOROUGHLY after handling, rub them down with cooking oil, then wash again! Do not rub your eyes, nose or mouth while handling these. And to the men out there: we’ve all had that “friend” who… well, you know where I’m going, just don’t! If cooking ghost chilies or other super hots over high heat, keep windows open and have your kitchen fan going at full speed. Try to avoid breathing in the fumes. Chef’s handling these peppers regularly in restaurant kitchens wear breathing masks and goggles and it’s not just for show. We all respond very, very differently to capsaicin, so these are general guidelines. You may laugh. But then again, you may really hurt yourself. Don’t say I didn’t warn you. That being said, for those of us who can take the heat, there are a lot of exciting things that can be done with ghost chilies. And hot sauce is one pretty obvious application. Personally, I’m a huge fan of hot sauces! It’s one of my favorite things. I must have tried hundreds, especially during my travels in the States. Many I’ve loved, some I’ve hated (Tabasco most notably) and others I’ve downright gotten addicted to. (I’ve already spoken about my love for Sriracha a number of times). Strangely, though, it’s only very recently I’ve gotten into making hot sauces myself. A shame, really, because making your own hot sauces is not only easy, it’s also a ton of fun. So, with this newfound fascination in mind, and a pound of ghost chilies at my disposal, nothing seemed more obvious to me than trying to come up with a Ghost Chili hot sauce. First and foremost, I wanted to create a hot sauce that would really showcase the exotic aromas and fruitiness of the ghost chilies that I so love, and would help make them a little more approachable to the general public. The sauce I ended up creating – my Ghost Chili Mango Hot Sauce – uses red bell peppers, onions and mangos to take some of the top off the heat, but the ghost chilies still power through, make no mistake. Ingredients for Ghost Chili Mango hot sauce. The mangos (along with the garlic) help add to the exotic character of the sauce and compliment the fruitiness of the ghost chili all while (I found out) adding a beautiful color to the finished sauce. The apple cider vinegar along with the honey create an initial sweetness which is followed by a serious and lengthy afterburn. While only 12 ghost chilies, a total of about 100 grams, are used to create 2-3 liters of sauce, this stuff is pretty damn hot and should last you a while. The flavor matches the heat, though, so a little sauce adds a lot of flavor. Too hot for you? As mentioned a few times now, Ghost Chilies are pretty hot little things. If you’re worried about the level of heat, check below the recipe for some tips on turning it down a bit. You are, after all, the boss of your hot sauces and should adjust them according to your liking. The ingredient amounts below are merely my suggestions and I have some pretty serious heat issues. Mango and honey lessen the burn and add to the tropical aromas of this awesome and blazingly hot condiment. Ingredients below makes 2-3 liters of sauce! For a slightly lesser burn, carefully remove seeds and seed membranes from the chilies. Be careful when cutting the mangoes. The flesh is slippery and the pit is irregularly sized. After peeling, cut off a small piece of flesh on one side to give you a level surface to work on. Lay the mango on this surface and proceed carefully using a very sharp knife. The pretty end result: Twelve little buggers make two liters of blazingly hot sauce. 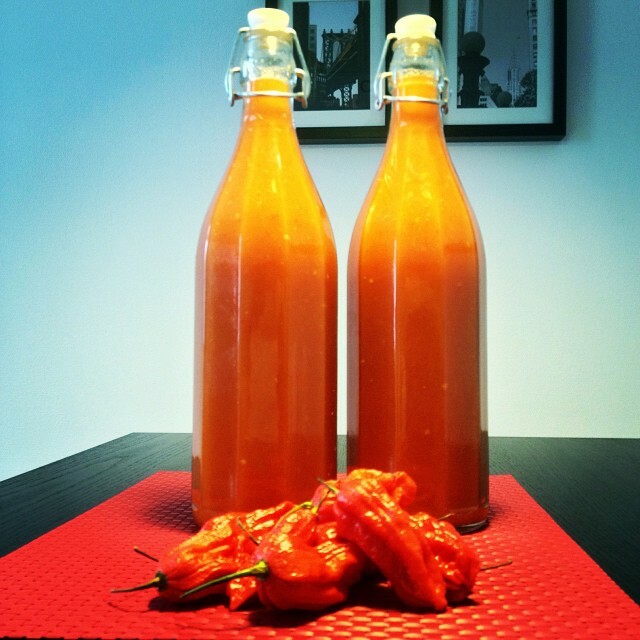 Ghost Chili Mango Hot Sauce: Hot enough for ya? Can’t get fresh ghost chilies in your area? Or fear they’re too hot? Well, fear not, this sauce would fare very well if made with another slightly milder super hot variety such as Habanero or Scotch Bonnet. They offer many of the same tropical aromas and fruitiness but not quite the same kick. Nervous about the heat? I wouldn’t recommend using anything else than a tropical super hot here. Like I said, it adds some very distinct characteristics. I would recommend, however, using fewer chilies if you don’t want it blazingly hot. You could probably go half of what I used and still have a pretty hot concoction. Or use just a few and still have a nice heat at the back of your throat. You could also use more, but then you’re on your own. Looking for a good use for this sauce? Why not try our Ghost Pepper Chili based on a loyal reader’s turkey chili? This entry was posted in Recipes and tagged chili, ghost chili, man food, sauce. 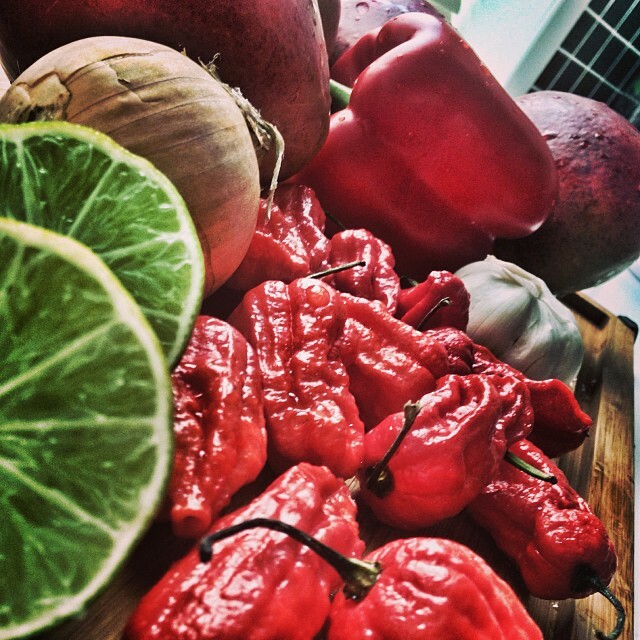 Just been growing ghost chilli’s 7 pots and scotch bonnets have been storing them in the freezer and thought i would give your recipe a go!!!!! Wear gloves and eye protection!!!! This is super hot and will try it on my mates who think they are avid chilli eaters!!!! Hi Bazz! Suggestion to wear eye protection is hereby passed on! Thanks for giving it a spin, I hope you don’t hurt your mates too much.. If it’s too much, the heat probably can be cut with sugar or sugar syrup. Hi there, thank you so much for your comments and kind words! 🙂 Congratulations on winning such a fine stash of Ghost Chilies. To answer your questions, I would make this again, it’s unique and *quite* hot, but nowhere near as hot as the peppers on their own. Also, a curious aspect I found is that it seems to mellow slightly with age. But still, a little goes quite a long way, especially at first. I’m a bachelor and as such have no immediate family to try it out on, my friends have tried it, though and found it quite curious and exciting… In moderation! You’re so welcome, merryn 🙂 I’d hate seeing food go to waste. The tinned mangos may even be a good idea as they’re probably sweeter than the regular kind and sweetness does help lessen the burn. Do use the resulting sauce sparingly and, at least in the beginning, consider using it in applications where it will have a chance to get heated through a second time. it will still be plenty hot, but it’s a more bearable and nuanced kind of hot. Can this recipe be made with dried chost peppers or do they need to be fresh? Very valid question. You can easily substitute dried ghost peppers for fresh ones in almost any recipe. Thankfully, peppers maintain most of their flavor, heat and characteristics when dried. What you’ll want to do, though, is snip the tops off and shake/squeeze the seeds out best as you can. They’re bitter. Then you’ll want to reconstitute the dried peppers in water for about 30-60 minutes until they’re soft and pliable. Then use as you would fresh. Hey Johan, i’m currently busy growing my own bhut jolokia, but given that I started late I doubt i’ll get any in time for this years harvest. Can you suggest any locations where to get them in the Århus area? I nothiced that you too are in the region. I am, if nothing else, likely going to get some BOC’s later this year, can they do as a substitute? The chili’s i’m growing otherwise is a chocolate scotch bonnet, Trinidad Moruga Scorpion (youch, this’ll be hot), the BOC, some Tabasco chili and some yellow habanero. Anyway, BOC would make a beautiful substitute for regular Bhut in this recipe. If anything, the outcome will probably be even better. I have plans to try a BOC version myself, actually. I’m not sure about physical locations, but you can get them dried via mail order from chilihouse.dk amongst other. See my reply to Dan about how to go about using dried chilies instead of fresh. Johan, a great base recipe thank you. I am in Canada and suffice to say growing conditions here are not ideal for ghost peppers but I did mange enough this week (Nov. 1, 2017) to make the hot sauce I planned in the spring. Like everyone, i made a couple of modifications like using mango puree instead of fresh and a combination of white clover honey and maple syrup, after all it is Canada. Also added real cinnamon bark, Madagascar vanilla extract, sherry vinegar and a bouquet garni of clove that I fish out after reducing. The end result is an outstanding combination of big heat, sweet and savoury Caribbean spices. Holy awesomeness, Brad! Thanks for chiming in and offering your thoughts and modifications! I’m so glad this worked out for you and your result sounds fantastic! Just made this sauce with ghost chillis coming into season. Fantastic recipe, really warm, but not to the point of being inedible. Thanks for posting. About how much water would you add. How much is to cover? After the 45 minutes of simmering, should there be water remaining? Thanks. Anxious to try this recipe.. If I’m being perfectly honest, I didn’t measure. I used a pot that fit the ingredients about to the brim and then just added enough water to barely cover. The exact amount isn’t that important. Yes, there should be water remaining after simmering, it eases the blending and creates a smoother sauce. Hi Johan. Just finished making your sauce with ghost peppers I grew. I live in eastern Canada ( Quebec). I’ve been waiting for them to ripen and become red. This is a wonderful hot sauce . The mango flavor comes through and the sweetness of the honey doesn’t let the heat, which is extreme, to stick around too long. Thank you for posting the recipe. I still have about another dozen which are still green but will be red in a week or so. I plan on making a hot jelly with them. Also it is a beautiful color. Jeff, thank you so much for the kind words and for trying out the recipe. I’m glad you like the sauce, both on taste, balance and appearance. Hot jelly is awesome. Good luck! How long can the sauce stay in the containers on the shelf? How do you know whether it is still good or when it has gone bad? in all honesty, I can’t really tell you about shelf-life. I’ve kept it refrigerated and never had it spoil on me 🙂 Expect at least a couple of months in the fridge. You’ll know without doubt from the smell if it’s gone bad. It’ll get an earthy, sour, moldy funk to it.